2011-04-15 Application filed by Dr. Reddy's Laboratories Ltd., Dr. Reddy's Laboratories, Inc. filed Critical Dr. Reddy's Laboratories Ltd. Processes for preparing lacosamide, for use in pharmaceutical compositions comprising lacosamide. Aspects of the present application relate to processes for the preparation of lacosamide, and to pharmaceutical compositions comprising lacosamide. The drug compound having the adopted name "lacosamide" can be represented by structural formula (I), and is in a class of functionalized amino acid derivatives that are useful as anticonvulsants. Lacosamide is a functionalized D-serine derivative in the R-configu ration. 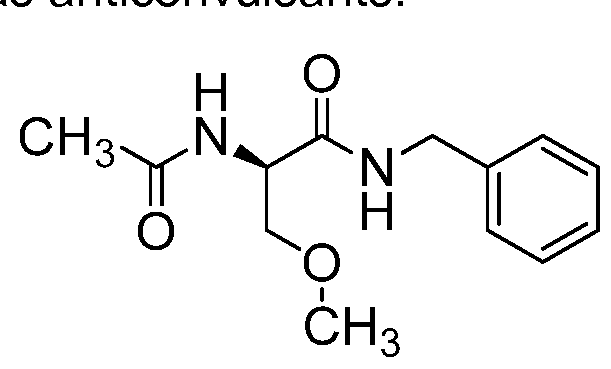 A chemical name for lacosamide is (R)-2-acetamido-N-benzyl-3- methoxypropionamide, and it is the active ingredient in VIMPAT® (lacosamide) tablets and injections, for the treatment of partial-onset seizures. U.S. Patent No. 5,654,301 broadly discloses lacosamide and related compounds, pharmaceutical compositions thereof, and their uses as potential anticonvulsants. U.S. Patent No. RE38551 specifically discloses lacosamide and related compounds in the R-configuration, pharmaceutical compositions thereof, and a method of treating central nervous system disorders in an animal, comprising administering to said animal in need thereof an anticonvulsant effective amount of the said compounds. It also discloses three routes for preparing lacosamide. Activities of W-Benzyl-2-acetamidopropionamide Derivatives, Journal of Medicinal Chemistry, 1996, 39(9), 1907-1916; (b) U.S. Patent No. 6,048,899; (c) S.
Intermediate Compounds And Their Use In Preparation Of Lacosamide", IP.com Journal 2009, 9(4A), 35; and (i) International Application Publication No. WO 2010/05201 1 A1 . lacosamide have been identified, but only crystalline polymorphs 1 and 2 are routinely formed in the regular synthesis of lacosamide, and only these forms are present in lacosamide production batches. Crystalline polymorphs 3 and 4, and the amorphous state, only form under unique conditions, or are not stable, and are not present in lacosamide production batches. Polymorph 3 is a crystalline, metastable modification that appears only by crystallization from methylene chloride at room temperature. Polymorph 4 is stable only up to -120°C and converts to polymorph 1 above that temperature. The amorphous form is widely unstable under normal laboratory conditions and converts rapidly to a crystalline form. There are no significant effects of polymorphism on the dissolution or bioavailability of lacosamide, therefore it is not necessary to control the form. U.S. Patent Application Publication No. 2009/0298947 A1 discloses lacosamide crystalline polymorphic forms designated as Form I, Form II, Form III, an amorphous form, and pharmaceutical compositions thereof. It also discloses processes for the preparation of these forms. International Application Publication No. WO 2010/060624 A2 discloses lacosamide crystalline polymorphic forms designated as Form R, Form S, and Form T, and pharmaceutical compositions thereof. It also discloses processes for the preparation of the forms. The forms have been characterized by powder X-ray diffraction ("PXRD") patterns. Dolberg et al., "Lacosamide (CAS RN = 175481 -36-4) Diffraction Pattern", IP.com Journal 2009, 9(9B), 68 discloses a PXRD pattern, differential scanning calorimetry (DSC) curve, and thermogravimetric analysis (TGA) curve of lacosamide, recrystallized from 2-propanol. lacosamide having a stable polymorphic form or a stable mixture of polymorphic forms. Fig. 1 depicts a PXRD pattern of (R)-2-acetamido-3-hydroxypropionic acid, obtained by the procedure of Example 1 . Fig. 2 depicts a PXRD pattern of (R)-2-acetamido-N-benzyl-3-hydroxy- propionamide, obtained by the procedure of Example 5. Fig. 3 depicts a PXRD pattern of lacosamide, obtained by the procedure of Example 1 1 . Fig. 5 depicts a DSC curve of lacosamide, obtained by the procedure of Example 12, where the x-axis shows temperatures in °C and the y-axis values are in mW/gram units. preparation of lacosamide include three- or, optionally, four-step processes that have any one or more of the following five attributes: (i) involve the use of commercially available D-serine; (ii) do not involve protection of D-serine; (iii) do not involve the use of pyridine during acetylation; (iv) do not involve the use of silver oxide for methylation; and (v) avoid partial racemization occurring from nonselective methylation. In embodiments of step 1 ), D-serine that is used as the starting material for the preparation of lacosamide can be prepared using any method and, optionally, can be purified using any method to improve its chemical and optical purities. D- serine is readily available from several commercial sources. In embodiments of step 1 ), acetylation of D-serine can be carried out using any acetylating agent known in the art. Acetylating agents that are useful in the reaction include, but are not limited to, acetic acid, acetic anhydride, and acetyl chloride. Further, in specific embodiments, an acetylating agent can be used in amounts from about 1 mole to about 3 moles, per mole of D-serine. The acetylating agent can be used in a single lot, or combined in portions with a reaction mass containing D-serine. The acetylating agent can be used neat, or in combination with a solvent described below. In embodiments of step 1 ), acetylation of D-serine can be carried out in the presence of a base. The base can be an inorganic base or an organic base. Bases that are useful in the reaction include, but are not limited to: hydroxides, carbonates, bicarbonates, oxides, carboxylates, and alkoxides of alkali or alkaline earth metals, such as sodium hydroxide, potassium hydroxide, sodium carbonate, and potassium carbonate, or primary, secondary, and tertiary amines, such as ammonia, triethylamine, and diisopropylamine. In embodiments of step 1 ), acetylation of D-serine can be carried out in a suitable solvent. Solvents that are useful in the reaction include, but are not limited to: C-1-6 alcohols; C3-6 ketones; C2-6 ethers; C3-6 esters; C2-6 nitriles; halogenated hydrocarbons; C5-8 aliphatic or aromatic hydrocarbons; aprotic polar solvents; any mixtures of two or more thereof; and their combinations with water in various proportions. In embodiments of step 1 ), an acetylating agent can be added to a reaction mass containing D-serine, or D-serine can be added to a reaction mass containing an acetylating agent, at any suitable temperatures, such as from about -15°C to about 50°C, or from about -10°C to about 40°C. The temperatures of the reaction mass may be maintained at about the initial temperatures, or may be raised, such as to temperatures from about 20-40°C, after the reactants are combined. In embodiments of step 1 ), a reaction of D-serine and acetylating agent can be maintained for about 1 hour to about 10 hours, or longer. In embodiments, the reaction is maintained for times from about 15 minutes to about 4 hours. In embodiments of step 1 ), the acetylation reaction can be followed by adjustment of pH to values from about 1 to about 3, by adding a suitable acid, such as a mineral acid. In embodiments, hydrochloric acid is used to adjust the pH of the reaction mass to values from about 1 to about 2. In embodiments, any sources of hydrochloric acid may be used for adjusting the pH of the reaction mass. The source may be aqueous hydrochloric acid, gaseous hydrogen chloride, hydrogen chloride in an organic solvent, etc. In embodiments, aqueous hydrochloric acid, or hydrogen chloride in methanol, is added to adjust the pH of the reaction mass to values from about 1 to about 2, or about 1 .9. In embodiments of step 1 ), the reaction mass may be filtered to remove undesired solids and the filter bed may be washed with the same solvent or with any solvent described above. concentration. The solvents that are useful for slurrying include the solvents described for the acetylation step, above. In embodiments of step 1 ), (R)-2-acetamido-3-hydroxypropionic acid produced in the reaction can be isolated using techniques such as decantation, filtration by gravity or suction, centrifugation, and the like, optionally including washing the solid with a solvent. In embodiments, (R)-2-acetamido-3-hydroxy-propionic acid that is isolated can be dried at suitable temperatures, such as from about 40°C to about 100°C, and suitable pressures, using any drying equipment, such as a tray dryer, vacuum oven, air oven, fluidized bed dryer, spin flash dryer, flash dryer, and the like. Drying temperatures and times will be sufficient to achieve a desired product purity. In specific embodiments, (R)-2-acetamido-3-hydroxypropionic acid is dried in an oven at 55°C for about 1 hour to about 5 hours, or longer, under vacuum. In embodiments, isolated (R)-2-acetamido-3-hydroxypropionic acid can be in a crystalline, amorphous, hydrated, or solvated form. In embodiments, isolated (R)-2-acetamido-3-hydroxypropionic acid has a polymorphic form having a PXRD pattern with peaks located at about 12.0, 13.9, 19.6, 20.8, 22.9, 24.1 , 24.8, 25.9, 27.8, 28.6, 30.6, 32.0, 32.8, 33.6, and 35.2, ±0.2° 2Θ. The product of step 1 ), (R)-2-acetamido-3-hydroxypropionic acid, can be purified using any method to improve its chemical and optical purities. Any of the solvents listed in step 1 ) can be used for the purification of (R)-2-acetamido-3- hydroxypropionic acid. Purification of (R)-2-acetamido-3-hydroxypropionic acid can be accomplished using crystallization, recrystallization, slurry washing, column chromatography, and other methods, using the solvents that are described above for the acetylation reaction or any other solvents. In embodiments of step 2), (R)-2-acetamido-3-hydroxypropionic acid can be present in a suitable solvent. It can also be present in a reaction mass prepared from the acetylation of D-serine. Solvents that are useful include, but are not limited to: water, d-6 alcohols; C3-6 ketones; C2-6 ethers; C3-6 esters; C2-6 nitriles; halogenated hydrocarbons; C5-8 aliphatic or aromatic hydrocarbons; aprotic polar solvents; and any mixtures of two or more thereof. In embodiments, the reaction is carried out in methanol. In embodiments of step 2), (R)-2-acetamido-3-hydroxypropionic acid can be reacted with a suitable base. The base can be any organic or inorganic base. Examples of bases that are useful in the reaction include, but are not limited to: hydroxides, carbonates, bicarbonates, oxides, carboxylates, or alkoxides of alkali or alkaline earth metals, e.g., sodium hydroxide, potassium hydroxide, sodium carbonate, and potassium carbonate; and primary, secondary, or tertiary amines, such as ammonia, triethylamine, diisopropylamine, and N-methylmorpholine. The product of step 1 ), (R)-2-acetamido-3-hydroxypropionic acid, can be reacted with a suitable base at temperatures from about 0°C to about -90°C. In embodiments of step 2), the reaction mass can be treated with isobutyl chloroformate at temperatures from about 0°C to about -90°C. In embodiments, the reaction is carried out at temperatures about -40°C to about -90°C. Isobutyl chloroformate acts as an activator of carbonyl groups. In embodiments of step 2), the reaction mass can be reacted with benzylamine at temperatures from about 0°C to about -90°C, or about -40°C to about -90°C, or about -80°C, under an inert atmosphere, such as a nitrogen atmosphere. In embodiments of step 2), the reaction mass can be maintained at temperatures from about 0°C to about -90°C for about 30 minutes to about 4 hours, or longer. In specific embodiments, the reaction mass is maintained at about -80°C for about 2 hours, or longer. In embodiments of step 2), after substantial reaction completion the reaction mass is brought to temperatures from about 10°C to about 40°C. The reaction mass can be maintained at these temperatures for about 30 minutes to about 4 hours, or longer. In embodiments of step 2), the reaction mass can be filtered and the solid may be washed with the same solvent used for the reaction, or with any solvent described for this step. In embodiments of step 2), the product can be isolated from the reaction mass using any suitable techniques. The reaction mass can be evaporated at suitable temperatures, under suitable pressures. In embodiments, the solvent is evaporated completely under vacuum to obtain a solid residue. In embodiments of step 2), a solid residue that is obtained can be recovered and/or purified using any suitable techniques. Any of the solvents listed for step 2) can be used for the purification of a solid residue. For example, a solvent like methanol, ethanol, 2-propanol, acetone, water, ethyl acetate, tetrahydrofuran, acetonitrile, or any mixtures thereof, is combined with the residue to prepare a solution. Any unwanted salt or byproduct that is formed can be removed by a suitable technique like filtration. The product, (R)-2-acetamido-N- benzyl-3-hydroxypropionamide, can be isolated from the solution using any suitable techniques, such as evaporation of solvent or cooling of the solution. In specific embodiments, a mixture of water and ethyl acetate is used to prepare a clear solution of the residue, which is then cooled to below 15°C and the product is isolated by filtration. The isolated solid can optionally be washed and dried. In embodiments of step 2), a purification process as described above may be repeated any number of times, to get enhanced purity. In embodiments, (R)-2-acetamido-N-benzyl-3-hydroxypropionamide that is isolated can be dried at suitable temperatures, such as from about 40°C to about 100°C, and at suitable pressures, using any drying equipment, such as a tray dryer, vacuum oven, air oven, fluidized bed dryer, spin flash dryer, flash dryer, and the like. Drying temperatures and times will be sufficient to achieve a desired product purity. In specific embodiments, (R)-2-acetamido-N-benzyl-3- hydroxypropionamide is dried in an oven at temperatures from about 70°C to about 75°C, for a time from about 5 hours to about 20 hours, or longer, under vacuum. In embodiments, isolated (R)-2-acetamido-N-benzyl-3- hydroxypropionamide can be in a crystalline, amorphous, hydrated, or solvated form. In embodiments, isolated (R)-2-acetamido-N-benzyl-3- hydroxypropionamide can be in a polymorphic form having a PXRD pattern with peaks located at about 8.0, 1 1 .3, 12.7, 16.0, 17.3, 18.0, 18.7, 20.5, 21 .9, 23.5, 24.0, 24.8, 25.5, 27.4, 29.0, 31 .6, and 33.8, ±0.2° 2Θ. 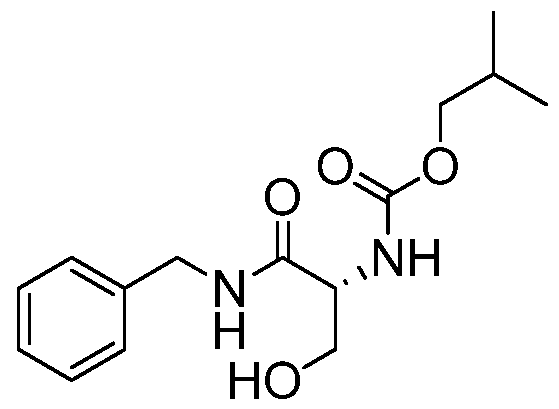 The product of step 2), (R)-2-acetamido-N-benzyl-3-hydroxypropionamide, can be purified using any methods to improve its chemical and optical purities. Any of the solvents listed in step 2) can be used for the purification of (R)-2- acetamido-N-benzyl-3-hydroxypropionamide. The purification may be done using crystallization, recrystallization, slurry washing, column chromatography, and any other methods. The solvents described in step 2) are useful for the purification. In embodiments of step 3), (R)-2-acetamido-N-benzyl-3- hydroxypropionamide is methylated by reacting with a suitable methylating agent. A partial racemization of lacosamide, such as occurs in the case of methylation of (R)-2-acetamido-N-benzyl-3-hydroxypropionamide with methyl iodide and silver oxide, can be avoided by using a methylating agent such as dimethyl sulphate, optionally in the presence of an organolithium compound such as n-butyllithium, or in the presence of a phase transfer catalyst such as tetrabutylammonium bromide (TBAB). halogenated hydrocarbons; C5-8 aliphatic or aromatic hydrocarbons; aprotic polar solvents; and any mixtures of two or more thereof. In specific embodiments, the reaction is carried out in mixtures of dichloromethane and toluene. In embodiments of step 3), (R)-2-acetamido-N-benzyl-3- hydroxypropionamide can be methylated in the presence of a base. The base can be an inorganic base or organic base. Examples of bases that are useful in the reaction include, but are not limited to: hydroxides, carbonates, bicarbonates, oxides, carboxylates, or alkoxides of alkali or alkaline earth metals, such as sodium hydroxide, potassium hydroxide, sodium carbonate, and potassium carbonate; or primary, secondary, or tertiary amines, such as ammonia, triethylamine, diisopropylamine, and ammonium hydroxide. In embodiments of step 3), (R)-2-acetamido-N-benzyl-3- hydroxypropionamide is methylated at any suitable temperatures. The methylation step can be carried out at temperatures from about 40°C to about -20°C, or from about 10°C to about 40°C. In embodiments, the reaction mass can be maintained at about 20°C to about 40°C for about 30 minutes to about 6 hours, or longer. In specific embodiments, the reaction mass is maintained at about -15°C to about 40°C for times from about 4 hours to about 6 hours. In embodiments of step 3), after substantial reaction completion the reaction mass is brought to a temperature from about 15°C to about 40°C and maintained at the same temperature for about 2 hours to about 6 hours, or longer. In specific embodiments, the reaction mass is maintained at about 25°C for about 5 hours. separation of organic and aqueous layers may be required before isolation of the product. The organic layer may be washed with water. The aqueous layer may be extracted with an organic solvent to improve the product yield. The organic layer can optionally be treated with activated charcoal or carbon. In embodiments of step 3), lacosamide extracted into an organic solvent can be isolated using any techniques. For example, the solvent can be removed by evaporation, or the organic layer can be cooled to isolate the product. In embodiments of step 3), the solvent can be removed partially, then additional solvent or solvents may be added. The solvents which may be used for this embodiment are chosen from the solvents described above. In specific embodiments, the solvent that is added may be water, toluene, or a combination thereof. Further removal of solvent may be done, if desired, to improve the yield. In embodiments of step 3), lacosamide may be isolated from the mass by cooling, or evaporation of the solvent or solvents, followed by maintenance of the reaction mass at lower temperatures for 30 minutes to 10 hours, or longer. In specific embodiments, the product may be isolated by filtration. The isolated solid can optionally be washed with the same solvent before drying. In embodiments, lacosamide that is isolated can be dried at suitable temperatures, such as from about 40°C to about 100°C, and at suitable pressures, using any drying equipment, such as a tray dryer, vacuum oven, air oven, fluidized bed dryer, spin flash dryer, flash dryer, and the like. Drying temperatures and times will be sufficient to achieve a desired product purity. In specific embodiments, lacosamide is dried in an oven at temperatures from about 55°C to about 75°C, for about 10 to about 20 hours, or longer, under vacuum. In embodiments of step 3), lacosamide obtained may be further purified without drying. In embodiments of step 4), purification of lacosamide and preparation of a crystalline or amorphous form of lacosamide can be carried out using any suitable techniques. Lacosamide can be purified by different processes, such as crystallization from a solvent, slurrying in a solvent, or with solvent-anti-solvent techniques, with different solvents under varying conditions of lacosamide-to- solvent ratios, heating temperatures or heating rates, maintenance times, cooling temperatures or cooling rates, and drying conditions or techniques. In embodiments of step 4), lacosamide can be purified by crystallization from a solvent. Solvents that are useful include, but are not limited to: Ci-6 alcohols; C3-6 ketones; C2-6 ethers; C3-6 esters; C2-6 nitriles; halogenated hydrocarbons; C5-8 aliphatic or aromatic hydrocarbons; aprotic polar solvents; any mixtures of two or more thereof; and their combinations with water in various proportions. In specific embodiments, crystallization of lacosamide is carried out in a mixture of dichloromethane and toluene. In specific embodiments, the application provides processes for the purification of lacosamide and for the preparation of a crystalline or amorphous form of lacosamide, embodiments comprising: (i) providing a clear solution of lacosamide; (ii) optionally, treating the clear solution with a carbon; (iii) optionally, filtering the solution to get a particle-free solution; (iv) optionally, partially or completely evaporating the solvent; (v) optionally, adding the same solvent or solvents or any solvent described above; (vi) cooling the solution to obtain solid lacosamide; (viii) filtering to separate solid lacosamide, optionally followed by washing the solid; and (ix) drying under suitable conditions. temperatures from about 10°C to the reflux temperature of the solvent. In embodiments of step 4), the solution may be from the previous step also. In embodiments of steps 3) or 4), a lacosamide solution obtained can be treated with activated charcoal and/or hydrose, in a suitable solvent. In embodiments of steps 3) or 4), lacosamide solution obtained can be filtered to get a particle-free solution. In embodiments of step 4), the solvent can be removed partially or completely and additional solvent or solvents may be added. The solvents that may be used for this embodiment are any of the solvents described above. In specific embodiments, the solvent that is added may be toluene. Further removal of solvent may be done, if desired to improve the yield. In embodiments of step 3) or 4), a small amount of solid lacosamide seed may be added before the initiation of solid formation. The quantity of seed material may range from 0.01 to about 30% by weight of the lacosamide contained in the solution. In embodiments of step 4), lacosamide may be isolated from the mass by cooling or evaporation of the solvent or solvents, followed by maintenance of the reaction mass for times from 30 minutes to about 10 hours, or longer, at temperatures from about 0°C to about 40°C. In specific embodiments, the product may be isolated by filtration. The isolated solid can optionally be washed with the same solvent before drying. In embodiments, lacosamide that is isolated can be dried at suitable temperatures, such as from about 40°C to about 100°C, and at suitable pressures, using any drying equipment, such as a tray dryer, vacuum oven, air oven, fluidized bed dryer, spin flash dryer, flash dryer, and the like. Drying temperatures and times will be sufficient to achieve a desired product purity. In specific embodiments, lacosamide is dried in an oven at temperatures from about 50°C to about 75°C, for about 3 hours to about 10 hours, or longer, under vacuum. Lacosamide obtained may be milled to produce a desired particle size distribution and may be further dried, if desired, using the procedures described herein. In embodiments, lacosamide produced can be in a crystalline, amorphous, hyd rated, or solvated form. Lacosamide produced by a method of the present application can have a polymorphic form with a PXRD pattern having characteristic peaks located at about 8.3, 12.9, 20.8, 24.9, and 25.3, ±0.2° 2Θ. The PXRD pattern of lacosamide obtained can be further characterized by peaks located at about 10.3, 15.5, 16.5, 21.3, 25.6, and 26.0, ±0.2° 2Θ. The crystalline form obtained may be same from both of steps 3) and 4). Lacosamide produced by a method of present application can have the same polymorphic form with the same PXRD pattern at all isolated stages. The polymorphic form of lacosamide described above is stable and substantially devoid of the other polymorphic forms. The crystalline polymorphic form obtained by reproducing Example 1 of US Patent No. RE38551 also has this same PXRD pattern. The stability data of the lacosamide indicates its consistency with respect to polymorphic form and impurities content. X-ray powder diffraction patterns described herein are generated using a Bruker AXS D8 Advance powder X-ray diffractometer, with a copper K-alpha radiation source. In the patterns of the drawings, the x-axis values are in degrees 2Θ and the y-axis values are in intensity units. A specific process for the preparation of lacosamide by a method of the present application can be illustrated as in Scheme 1. In embodiments of steps 3) and/or 4) described above, lacosamide prepared according to the methods described can be chemically and optically pure lacosamide having chemical purity greater than about 99%, or greater than about 99.5%, or greater than about 99.9%, by weight, and optical purity greater than 99%, or greater than about 99.5%, or greater than about 99.9%, as determined using high performance liquid chromatography (HPLC). In embodiments, lacosamide produced by a method of present application is chirally pure lacosamide having an S-isomer content less than about 1 %, or less than about 0.1 %, as determined using HPLC. In embodiments, lacosamide produced by a method of the present application is chemically pure lacosamide having purity greater than about 99.5% and containing no single impurity in amounts greater than about 0.15%, as determined using HPLC. In embodiments, lacosamide produced by a method of the present application is chemically pure lacosamide having purity greater than about 99.8% and containing no single impurity in amounts greater than about 0.1 %, as determined using HPLC. Potential impurities in lacosamide, apart from the starting materials and intermediates that are described in the present application, can have formulas as illustrated below. (R)-2-Amino-A/-benzyl-3-hydroxy-A/-methylpropanamide Generally, each of these possible impurities is present at less than about 0.1 % by weight, or not detected, in lacosamide produced according to a process of the present application. Diluent Buffer and acetonitrile = 90:10 (v/v). Mobile phase A: 1 .36 g of KH2PO4 dissolved in water, pH adjusted to 4.0 with orthophosphoric acid, and diluted to 1000 mL. Mobile phase B: Buffer and acetonitrile in the volume ratio 20:80. In embodiments of steps 3) and 4), lacosamide produced by a method of the present application has a specific optical rotation ranging from about 15° to about 17°. In embodiments of steps 3 and 4), lacosamide produced by a method of the present application has a moisture content less than about 0.8% by weight. The methods that may be employed for determining the moisture content can be any methods, such as a Karl Fischer titration. In embodiments of steps 3) and 4), lacosamide produced by a method of the present application has a DSC curve showing an endotherm at temperatures from about 144°C to about 147°C. In embodiment of 3 and 4), lacosamide produced by a method of present application has a bulk density ranging from about 0.1 g/mL to about 0.8 g/mL. In embodiments of steps 3 and 4), lacosamide produced by a method of the present application can have any morphology. In embodiments of steps 3 and 4), lacosamide produced by a method of the present application has an acicular aggregate morphology. In embodiments of steps 3 and 4), lacosamide produced by a method of the present application has specific surface area ranging from about 2 m2/g to about 5 m2/g. In embodiments of steps 3 and 4), lacosamide produced by a method of present application has an infrared ("IR") absorption spectrum having peaks at about 3289, 3086, 2923, 2876, 2819, 1636, 1547, 1 138, and 695, ±5 cm"1. Instruments Limited, Malvern, Worcestershire, United Kingdom, Coulter counters, microscopic procedures, etc. The term d(x) means that a particular fraction has particles with a maximum size being the value given, x=0.1 representing 10% of the particles, x=0.5 representing 50% of the particles, and x=0.9 representing 90% of the particles. An aspect of the present application provides pharmaceutical compositions containing a therapeutically effective amount of lacosamide prepared by a process of the application, together with one or more pharmaceutically acceptable excipients. The pharmaceutical compositions comprising lacosamide of the application together with one or more pharmaceutically acceptable excipients may be formulated as: solid oral dosage forms, such as, but not limited to, powders, granules, pellets, tablets, and capsules; liquid oral dosage forms, such as, but not limited to, syrups, suspensions, dispersions, and emulsions; and injectable preparations, such as, but not limited to, solutions, dispersions, and freeze-dried compositions. Formulations may be in the form of immediate release, delayed release, or modified release. Further, immediate release compositions may be conventional, dispersible, chewable, mouth dissolving, or flash melt preparations, and modified release compositions may comprise hydrophilic or hydrophobic, or combinations of hydrophilic and hydrophobic, release rate-controlling substances to form matrix or reservoir systems, or combinations of matrix and reservoir systems. The compositions may be prepared using any one or more of techniques such as direct blending, dry granulation, wet granulation, and extrusion and spheronization. Compositions may be presented as uncoated, film coated, sugar coated, powder coated, enteric coated, and modified release coated. The following definitions are used in connection with the compounds and processes of the present application, unless the context indicates otherwise. In general, the number of carbon atoms present in a given group is designated "Cx- Cy", where x and y are the lower and upper limits, respectively. For example, a group designated as "CrC6" contains from 1 to 6 carbon atoms. The carbon number as used in the definitions herein refers to carbon backbone and carbon branching, but does not include carbon atoms of the substituents, such as alkoxy substitutions and the like. The term "reacting" is intended to represent bringing the chemical reactants together under conditions such to cause the chemical reaction indicated to take place. "Alcohols" are organic solvents containing a carbon bound to a hydroxyl group. "C1-C6 alcohols" include, but are not limited to, methanol, ethanol, 2- nitroethanol, 2-fluoroethanol, 2,2,2-trifluoroethanol, hexafluoroisopropyl alcohol, ethylene glycol, 1 -propanol, 2-propanol (isopropyl alcohol), 2-methoxyethanol, 1 - butanol, 2-butanol, i-butyl alcohol, t-butyl alcohol, 2-ethoxyethanol, diethylene glycol, 1 -, 2-, or 3-pentanol, neo-pentyl alcohol, t-pentyl alcohol, diethylene glycol monomethyl ether, diethylene glycol monoethyl ether, cyclohexanol, phenol, glycerol, and the like. neoheptane, 2,3-dimethylpentane, 2,4-dimethylpentane, 3,3-dimethylpentane, 3- ethylpentane, 2,2,3-trimethylbutane, n-octane, isooctane, 3-methylheptane, neooctane, cyclohexane, methylcyclohexane, cycloheptane, petroleum ethers, benzene toluene, ethylbenzene, m-xylene, o-xylene, p-xylene, trimethylbenzene, chlorobenzene, fluorobenzene, trifluorotoluene, anisole, and mixtures thereof. A "aprotic polar solvent" has a dielectric constant greater than 15 and one or more of: amide-based organic solvents, such as N,N-dimethylformamide (DMF), Ν,Ν-dimethylacetamide (DMA), N-methylpyrrolidone (NMP), formamide, acetamide, propanamide, hexamethyl phosphoramide (HMPA), and hexamethyl phosphorus triamide (HMPT); nitro-based organic solvents, such as nitromethane, nitroethane, nitropropane, and nitrobenzene; pyridine-based organic solvents, such as pyridine and picoline; sulfone-based solvents, such as dimethylsulfone, diethylsulfone, diisopropylsulfone, 2-methylsulfolane, 3-methylsulfolane, 2,4- dimethylsulfolane, 3,4-dimethy sulfolane, 3-sulfolene, and sulfolane; and sulfoxide-based solvents such as dimethylsulfoxide (DMSO). An "ester" is an organic solvent containing a carboxyl group -(C=O)-O- bonded to two other carbon atoms. "C3-C6 esters" include, but are not limited to, ethyl acetate, n-propyl acetate, n-butyl acetate, isobutyl acetate, t-butyl acetate, ethyl formate, methyl acetate, methyl propanoate, ethyl propanoate, methyl butanoate, ethyl butanoate, and the like. An "ether" is an organic solvent containing an oxygen atom bonded to two other carbon atoms. "C2-6 ether solvents" include, but are not limited to, diethyl ether, diisopropyl ether, methyl t-butyl ether, glyme, diglyme, tetrahydrofuran, 2- methyltetrahydrofuran, 1 ,4-dioxane, dibutyl ether, dimethylfuran, 2- methoxyethanol, 2-ethoxyethanol, anisole, and the like. A "halogenated hydrocarbon" is an organic solvent containing a carbon bound to a halogen. Halogenated hydrocarbons include, but are not limited to, dichloromethane, 1 ,2-dichloroethane, trichloroethylene, perchloroethylene, 1 ,1 ,1 - trichloroethane, 1 ,1 ,2-trichloroethane, chloroform, carbon tetrachloride, and the like. A "ketone" is an organic solvent containing a carbonyl group -(C=O)- bonded to two other carbon atoms. "C3-6 ketones" include, but are not limited to, acetone, ethyl methyl ketone, diethyl ketone, methyl isobutyl ketone, ketones, and the like. A "nitrile" is an organic solvent containing a cyano -(C≡N) bonded to another carbon atom. "C2-6 nitrile solvents" include, but are not limited to, acetonitrile, propionitrile, butanenitrile, and the like. An "organic base" is an organic compound that reacts as a base. diisopropylamine, Hunig's base, DABCO, triethanolamine, tributylamine, pyridine, lutidine, 4-dimethylaminopyridine (DMAP), N-methylpyrrolidine, diethanolamine, 4- methylmorpholine, dimethylethanolamine, tetramethylguanidine, morpholine, imidazole, 2-methylimidazole, 4-methylimidazole, tetramethylammonium hydroxide, tetraethylammonium hydroxide, N-methyl-1 ,5,9-triazabicyclo[4.4.0] decene, 1 ,8-diazabicyclo[5.4.0]undec-7-ene, dicyclohexylamine, and picoline. (1 ,4,7,10,13,16-hexaoxacyclooctadecane), and polyethylene glycols. Certain specific aspects and embodiments of the present application will be explained in greater detail with reference to the following examples, which are provided only for purposes of illustration and should not be construed as limiting the scope of the application in any manner. Reasonable variations of the described procedures are intended to be within the scope of the present application. EXAMPLE 1 : Preparation of (R)-2-acetamido-3-hydroxypropionic acid. Sodium hydroxide (133.2 g) and water (300 mL) are charged into a round bottom flask and stirred to produce a clear solution. D-serine (100 g) is added at 27°C and the mixture is stirred to produce a clear solution. A mixture of acetyl chloride (33.8 mL) and toluene (68 mL) is added at 0°C over 90 minutes, and the mass is maintained at this temperature for 30 minutes. A mixture of acetyl chloride (33.8 mL) and toluene (68 mL) is added at 0°C over 60 minutes and the mass is maintained at this temperature for 30 minutes. A mixture of acetyl chloride (33.8 mL) and toluene (68 mL) is added at 0°C over 30 minutes and the mass is maintained at this temperature for 30 minutes. A mixture of acetyl chloride (10 mL) and toluene (20 mL) is added at 0°C over 30 minutes and the mass is maintained at this temperature for 30 minutes. The pH of the mass is adjusted to 2 with aqueous HCI (35%, 157 mL) at 0°C. The mass is filtered to remove a salt that forms. The organic and aqueous layers of the filtrate are separated and the aqueous layer is charged into a round bottom flask. About 90% of the volume is distilled under vacuum at 65°C and the mass is cooled to 27°C. Tetrahydrofuran (800 mL) is added and the mixture is stirred for 15 minutes. The salt that forms is removed by filtration. The solvent is distilled completely under vacuum at 75°C and then the mass is cooled to 28°C. Tetrahydrofuran (800 mL) is added and the mixture is stirred for 15 minutes. The organic layer is decanted and then distilled completely under vacuum at 62°C. The residue is cooled to 28°C, ethyl acetate (300 mL) is added, and the mixture is stirred for 1 hour, filtered and the solid is washed with ethyl acetate (100 mL). The solid is suction dried for 10 minutes and then dried at 55°C under vacuum to a constant weight. Endothermic peak in DSC curve at 1 13.7°C; Weight loss in TGA analysis: 0.97%; XRPD pattern as shown in Fig. 1 . EXAMPLE 2: Preparation of (R)-2-acetamido-3-hydroxypropionic acid. temperature for 30 minutes. Acetyl chloride (37.4 g) is added at the same temperature over 30 minutes and the mass is maintained at this temperature for 30 minutes. completely under vacuum at 43°C and the residue is dried. Product weight: 33.8 g (wet); Chiral purity: 99.3% by HPLC; Purity: 92.3% by HPLC. EXAMPLE 3: Preparation of (R)-2-acetamido-N-benzyl-3-hydroxypropionamide. (R)-2-acetamido-3-hydroxypropionic acid (5 g) and methanol (75 mL) are charged into a round bottom flask at 26°C and stirred to produce a clear solution. The solution is cooled to -68°C and N-methylmorpholine (9.5 mL) is added and stirred at the same temperature for 15 minutes. Isobutyl chloroformate (6.5 mL) is added at the same temperature, followed by the addition of benzylamine (5.5 mL) at the same temperature. The mass is maintained at the same temperature for 1 hour and then the temperature is raised to 25°C. The mass is distilled under vacuum at 45°C. Tetrahydrofuran (125 mL) is added and the mixture is stirred at 46°C for 10 minutes. The formed salt is separated by filtration and washed with tetrahydrofuran (10 mL), and the filtrate is distilled under vacuum at 45°C. dichloromethane (5 ml). The solid is dried under vacuum at 50°C for 5 hours. Product weight: 6.5 g; HPLC purity: 90.8%, Chiral purity: 99.88% by HPLC. EXAMPLE 4: Preparation of (R)-2-acetannido-N-benzyl-3-hydroxypropionannide. Methanol (750 mL) and NaOH (57.0 g) are charged into a round bottom flask and stirred to produce a clear solution, which is then cooled to 27°C. D- serine (50.0 g) is added at 27°C and stirred to produce a clear solution. Acetyl chloride (17.0 mL) is then added at -15°C over 30 minutes, and the mass is maintained at the same temperature for 30 minutes. Acetyl chloride (17.0 mL) is then added at -15°C over 30 minutes and the mass is maintained at the same temperature for 30 minutes. Acetyl chloride (17.0 mL) is then added to the mass at -15°C over 30 minutes and the mass is maintained at the same temperature for 30 minutes. Acetyl chloride (17.0 mL) is then added to the mass at -15°C over 30 minutes and the mass is maintained at the same temperature for 30 minutes. The mass is cooled to -40°C and the pH is adjusted to 1 .3 by adding hydrogen chloride in methanol (140 mL) at the same temperature. The unwanted salt is removed by filtration. N-Methylmorpholine (130 mL) is added to the filtrate at - 50°C and the mass is stirred at the same temperature for 10 minutes. Isobutyl chloroformate (80 mL) is added at -50°C under a nitrogen atmosphere and the mass is maintained for 30 minutes at the same temperature. Benzylamine (67.5 mL) is added at -50°C over 30 minutes and the mass is maintained at the same temperature for 1 hour. The mass is then heated to 27°C and the unwanted salt is removed by filtration and washed with methanol (100 mL). The filtrate is completely distilled at 48°C under vacuum. Acetone (1250 mL) is added to the residue at 27°C and stirred for 30 minutes. The unwanted salt is removed by filtration and washed with acetone (50 mL). The filtrate is completely distilled at 48°C under vacuum. Acetone (200 mL) is added to the residue at 27°C and stirred for 30 minutes. The unwanted salt is removed by filtration and washed with acetone (50 mL). The filtrate is completely distilled at 48°C under vacuum. The residue is dried at 55°C for 4 hours. Product weight: 53.0 g; Chiral purity: 99.9% by HPLC; HPLC purity: 97.6%. EXAMPLE 5: Purification of (R)-2-acetamido-N-benzyl-3-hydroxypropionamide. (R)-2-acetamido-N-benzyl-3-hydroxypropionamide (24.9 g), water (10 mL) and ethyl acetate (30 mL) are charged into a round bottom flask and cooled to 12°C. The mixture is stirred at the same temperature for 3 hours. The solid is filtered, washed with ethyl acetate (5 ml_), suction dried, then dried under vacuum in an oven at 55°C for 5 hours. Yield: 6.9 g; Chiral purity: 99.42%; HPLC purity: 91 .27%; PXRD pattern as shown in Fig. 2. EXAMPLE 6: Preparation of (R)-2-acetamido-N-benzyl-3-hydroxypropionamide. Methanol (80 L) and sodium hydroxide (9.12 Kg) are charged into a reactor and stirred to produce a clear solution. The mass is cooled to 33°C and D-serine (8 Kg) is charged into the reactor at the same temperature. The mass is cooled to -3°C and acetyl chloride (6 Kg) is added at -3°C to 1 °C, then the mass is maintained at 2-3°C for 45 minutes. Acetyl chloride (6 Kg) is added at 1 -2°C and the mass is maintained at -1 °C to 2°C for 45 minutes. The pH is adjusted to 1 .9 with methanolic HCI (28 L) at the same temperature. The temperature of the mass is raised to 25°C and maintained for 3 hours at 25-28°C. The mass is filtered and the solid is washed with methanol (8 L). 4-Methylmorpholine (23.12 Kg) is charged into a reactor at 30°C and stirred for 10 minutes at 30-32°C. The filtrate from above is added at 32-33°C. The mass is cooled to -80 ± 10°C using liquid nitrogen and then pre-cooled (15°C) isobutyl chloroformate (26 Kg) is added at -80°C to -85°C under a nitrogen atmosphere. The mass is maintained at -80°C to -84°C for 30 minutes and then a pre-cooled mixture (15°C) of methanol (8 L) and benzylamine (8.16 Kg) is charged into the reactor at -80 to -84°C. The mass is maintained at -80 to -86°C for 2 hours and then the temperature is raised to 25°C and maintained at 25-29°C for 2 hours. The mass is filtered and the collected solid is washed with methanol (8 L). The solvent is evaporated from the filtrate under vacuum below 39°C, then water (16 L) is charged into the reactor at 56°C, followed by maintaining the mass at about the same temperature for 30 minutes. The mass is cooled to 29°C, ethyl acetate (48 L) is charged, and the mass is maintained at 27-29°C for 30 minutes. The mass is cooled to 4°C and maintained at 3-5°C for 3 hours. The product is separated by filtration and washed with ethyl acetate (16 L). Water (32 L) and the wet material are charged into a reactor and stirred for 30 minutes. Ethyl acetate (8 L) is added and the mass is cooled to 15°C and maintained at 10-14°C for 5 hours. The product is separated by filtration, washed with ethyl acetate (16 L), and dried by suction, followed by drying at 70-73°C under vacuum for about 18 hours, to produce 7.70 Kg of the title compound. HPLC purity: 98.7% (total impurities: 1 .3%); Loss on drying: 0.37%. EXAMPLE 7: Preparation of lacosamide. acetonitrile (1 190 mL) are charged into a round bottom flask at 27°C, stirred for 10 minutes, and cooled to -5°C. A previously chilled solution of NaOH (71 .9 g) in water (255 mL) is added over 30 minutes at -5°C and the mass is maintained at the same temperature for 30 minutes. Dimethyl sulphate (226.8 g) is added over 2 hours at -5°C and the mass is maintained at the same temperature for 30 minutes. The temperature is then raised to 27°C and the mass is maintained at that temperature for 5 hours to produce a clear solution. The solvent is distilled completely at 55°C under vacuum. The residue is cooled to 27°C, ethyl acetate (391 mL) and water (391 mL) are added, and the mixture is stirred for 10 minutes. The mixture is adjusted to pH 7 with a solution of NaOH (1 .0 g) in water (10 mL) at 26°C, the mixture is maintained at the same temperature for 10 minutes, and then the organic and aqueous layers are separated. The aqueous layer is extracted with ethyl acetate (510 mL). The organic layer is washed with water (250 mL) and distilled completely at 54°C under vacuum. The residue is cooled to 27°C, ethyl acetate (500 mL) is added, and the mixture is heated to reflux and maintained for 10 minutes to produce a clear solution. Activated carbon (1 .5 g) is added and stirred for 10 minutes under reflux. The mass is filtered through a Hyflow (flux-calcined diatomaceous earth) bed at 60°C. The filtrate is cooled to 12°C and maintained for 1 hour at the same temperature. The formed solid is filtered, washed with ethyl acetate (50 mL), suction dried for 10 minutes, and then dried at 55°C under vacuum for 1 hour. Product weight: 74.6 g.
The ethyl acetate mother liquor obtained after filtration of lacosamide is completely distilled under vacuum at 52°C. Ethyl acetate (140 mL) is added to the residue and the mixture is heated to 55°C with stirring for 2 hours. The mass is then cooled to 12°C and maintained at the same temperature for 1 hour. The solid is filtered, washed with ethyl acetate (50 mL), suction dried for 10 minutes, and then dried at 55°C under vacuum for 5 hours. Product weight: 39.8 g. Combined product weight: 1 14.4 g; DSC: Endothermic peak at 147.1 °C; Chiral purity: 98.94% by HPLC; Purity: 99.04% by HPLC. EXAMPLE 8: Preparation of lacosamide. (675 mL) are charged into a round bottom flask at 27°C and stirred for 10 minutes. The mixture is cooled to -10°C. A previously chilled solution of NaOH (30.5 g) in water (135 mL) is added over 30 minutes at -10°C and the mass is maintained at the same temperature for 30 minutes. Dimethyl sulphate (174.0 mL) is added over 30 minutes at -10°C. Tetrabutylammonium bromide (2.4 g) is added at the same temperature. A solution of NaOH (31 .0 g) in water (135 mL) is then added at the same temperature over 30 minutes. The temperature is then raised to 27°C and the mass is maintained at the same temperature for 5 hours. Activated charcoal (5.0 g) is added at the same temperature and stirred for 30 minutes. The mass is filtered through a Hyflow bed and the bed is washed with acetonitrile (90 mL). The filtrate is distilled under vacuum at 45°C. The residue is cooled to 27°C and ethyl acetate (450 mL) is added. A 10% aqueous NaOH solution is added at 27°C to adjust the pH to 7.5. The organic and aqueous layers are separated. The aqueous layer is extracted with ethyl acetate (2x500 mL) and the total organic layer is dried with sodium sulphate. The organic layer is distilled completely at 48°C under vacuum and the residue is cooled to 27°C. Diethyl ether (500 mL) is charged to the residue and the mixture is stirred for 50 minutes at 27°C. The solid is filtered, washed with diethyl ether (50 mL), suction dried for 10 minutes, and then dried at 55°C under vacuum for 3 hours. The solid and ethyl acetate (390 mL) are charged into a round bottom flask at 27°C and heated to reflux to produce a clear solution. Activated carbon (5.0 g) is added and the mass is filtered after 10 minutes through a Hyflow bed at 27°C. The Hyflow bed is washed with ethyl acetate (65 mL), and then the filtrate is cooled to 3°C and maintained at the same temperature for 1 hour. The formed solid is filtered, washed with chilled ethyl acetate (50 mL), suction dried for 10 minutes, and then dried at 55°C under vacuum for 5 hours. Product weight: 44.0 g; Chiral purity by HPLC: 96.91 %; HPLC purity: 94.5. EXAMPLE 9: Purification of lacosamide. Lacosamide (22.0 g) and ethyl acetate (440 mL) are charged into a round bottom flask at 27°C and stirred. The mixture is heated to 60°C to produce a clear solution. The solution is cooled to 18°C and the formed solid is filtered, washed with ethyl acetate (22 mL), suction dried for 30 minutes, and then dried under vacuum in an oven at 54°C for 4 hours. Yield: 17.0 g; Chiral purity by HPLC: 99.96%; Purity: 99.95% by HPLC; DSC: Endothermic peak at 143.6°C; TGA weight loss: 0.01 %. 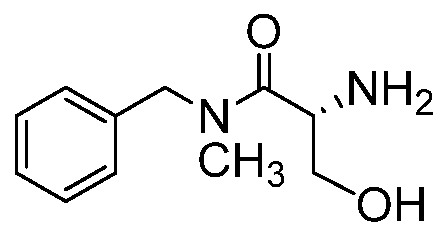 EXAMPLE 10: Preparation of lacosamide. temperature for 5 hours to produce a clear solution. The solvent is distilled completely at 50°C under vacuum. The residue is cooled to 27°C, water (5 mL) and toluene (40 mL) are added, and the mass is stirred for 90 minutes at the same temperature. The mass is filtered and the solid is washed with toluene (10 mL). The solid is suctionk dried for 10 minutes and then dried at 60°C under vacuum for 4 hours. EXAMPLE 1 1 : Preparation of lacosamide. tetrabutylammonium bromide (0.18 kg) are added and the mass is cooled to 18°C. Dimethyl sulphate (14.98 Kg) is added slowly at 18-21 °C. The temperature of the mass is raised to 28°C and maintained for 5 hours. The mass is allowed to settle and the organic layer is separated. Aqueous ammonia solution (3.5 L) is added to the organic layer, and the mixture is cooled to 28°C and maintained for 3 hours. The mass is allowed to settle and the organic layer is separated. Dichloromethane is evaporated from the organic layer under vacuum below 38°C to a remaining volume of about 22 L. Water (14 L) is added to the mass and evaporation of dichloromethane is continued under vacuum below 33°C. Toluene (70 L) is added and the mass is maintained at 28-32°C for 5 hours. The solid is isolated by filtration, washed with toluene (14 L), and dried at 70-74°C under vacuum for 15 hours to produce 4.40 Kg of lacosamide (Yield : 59.3%). Loss on drying: 0.23%. Fig. 3 shows the PXRD pattern of the lacosamide obtained. EXAMPLE 12: Purification of lacosamide. Dichloromethane (20 L) and toluene (50 L) are charged into a reactor and lacosamide (5 Kg) is added. The mass is heated to 61 °C and maintained for 45 minutes at 61 °C to 64°C to produce a clear solution, then it is filtered through a filtration apparatus which is heated to 62°C. Toluene (10 L) is added to the filtrate and the mass is maintained for 30 minutes at 62-63°C. The mass is cooled to 53°C and lacosamide seed (0.15 Kg) is added at the same temperature. The mass is cooled to 30°C and maintained at 25-30°C for 4 hours, 30 minutes. The solid is isolated by filtration, washed with toluene (10 L), and then dried by suction. The wet solid is further dried at 71 -74°C under vacuum for 4 hours to obtain 4.2 Kg of purified lacosamide (Yield: 84%). The product obtained is milled through a 1 mm screen and then dried at 71 -74°C under vacuum for 13 hours. The product is sieved to produce a lump-free powder (4.06 Kg). 0.004%); Loss on drying : 0.13%; Particle size data : d(0.1 ): 1 .883 urn, d(0.5): 6.335, d(0.9):28.712; Bulk density : 0.21 g /mL and tapped density : 0.38 g/mL; Specific surface area : 3.8042 ± 0.0225 m2/g. Fig. 4 shows the PXRD pattern of the lacosamide obtained. Fig. 5 shows the DSC curve of the lacosamide obtained. c) reacting (R)-2-acetamido-N-benzyl-3-hydroxypropionamide with dimethyl sulphate in the presence of a base, to form lacosamide. 2. The process of claim 1 , wherein acetylating comprises reacting D- serine with acetyl chloride or acetic anhydride. 3. The process of claim 1 , wherein acetylating comprises reacting D- serine with acetyl chloride. 4. The process of claim 1 , wherein (R)-2-acetamido-3-hydroxypropionic acid is not isolated prior to the reaction of step b). 5. The process of claim 1 , wherein the reaction of step c) is conducted in the presence of a phase transfer catalyst. 6. A process for preparing lacosamide, comprising acetylating D-serine with acetyl chloride in presence of sodium hydroxide in methanol, to form (R)-2- acetamido-3-hydroxypropionic acid. 7. A process for the preparing lacosamide, comprising methylating (R)- 2-acetamido-N-benzyl-3-hydroxypropionamide with dimethyl sulphate in the presence of a base. 8. The process of claim 7, wherein a base is an alkali metal hydroxide. hydrocarbon, aliphatic or aromatic hydrocarbon, any mixtures thereof, or their combinations with water. 10. The process of claim 7, wherein methylating is conducted in a solvent comprising dichloromethane and toluene. 1 1 . The process of claim 7, wherein methylating is conducted in the presence of a phase transfer catalyst. 12. The process of claim 7, wherein methylating is conducted in the presence of tetrabutylammonium bromide. 13. A process for preparing crystalline lacosamide having a powder X- ray diffraction pattern with peaks located at about 8.3, 12.9, 20.8, 24.9, and 25.3, ±0.2° 2Θ, comprising recrystallizing lacosamide from a mixture of dichloromethane and toluene. 14. The process of claim 13, wherein a volume ratio of dichloromethane to toluene is about 1 :3. 15. The process of any of claims 1 -14, wherein lacosamide has a powder X-ray diffraction pattern substantially in accordance with the pattern of Fig. 4. 16. A pharmaceutical composition comprising lacosamide prepared according to any of claims 1 -14. ES2270819T3 (en) 2007-04-16 Formation and anion-exchange of crystalline salts ammonium internal echinocandin.